can you send projects reports sir?? could you please send projects reports sir?? Sir what are the libraries used in the program? 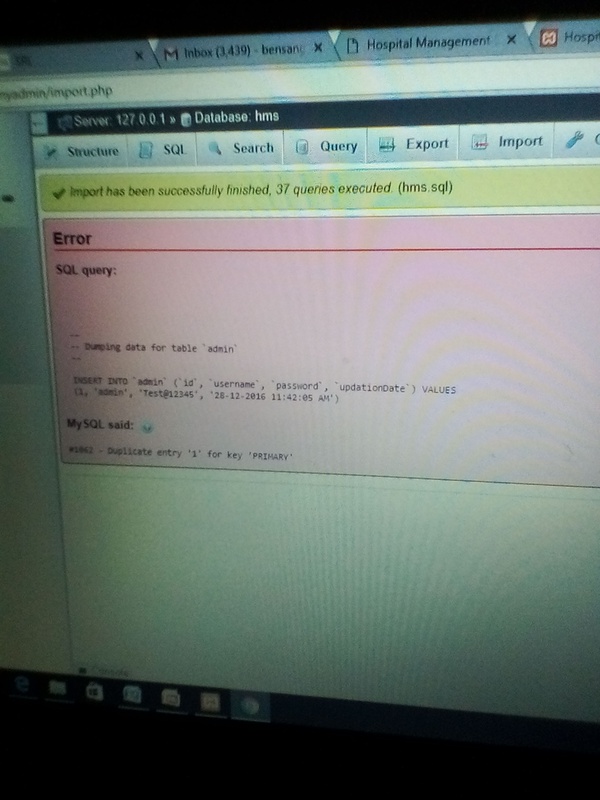 Sir in which file can we see the connection of mysql database with php? 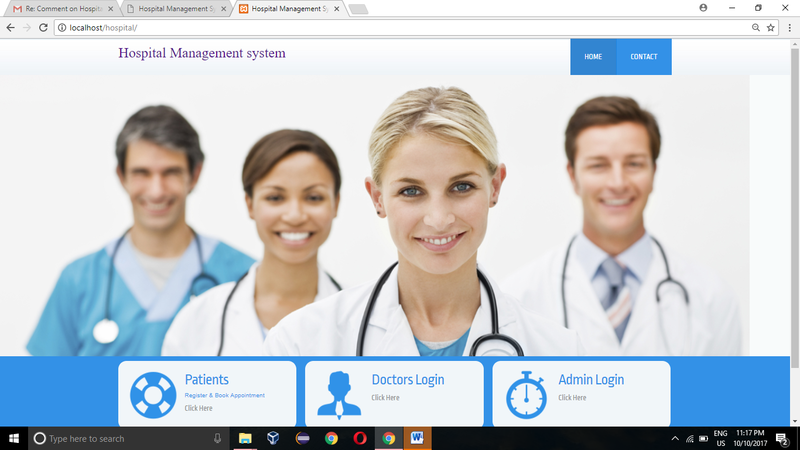 Sir i want to change the images used in the project. How can I proceed? Like the image used on the home page of site. You can change the images according to your need. I cannot find the code from where to change. https://uploads.disquscdn.com/images/5bd9e80c2d6f8cb2b023f8dd0622a0b71a3f8f649dfc29d3fa471162293efe28.png where to make the changes in the code to change the image? Hi sir https://uploads.disquscdn.com/images/b407b13c12bbdfbfdb36ddcdb11d9942cbe06f89bec6b4dac5d79a12d45582b3.jpg https://uploads.disquscdn.com/images/aa7b386c448bfcd6e6d8ef3ace8589b59c7f529f179a0a904b070b34cfe87143.jpg https://uploads.disquscdn.com/images/aa7b386c448bfcd6e6d8ef3ace8589b59c7f529f179a0a904b070b34cfe87143.jpg https://uploads.disquscdn.com/images/b23ae98b245b546ad3af854770bf54f97c7ab1270fb519f2eaa85d815c8e6504.jpg . I put the hospital folder in root directory. 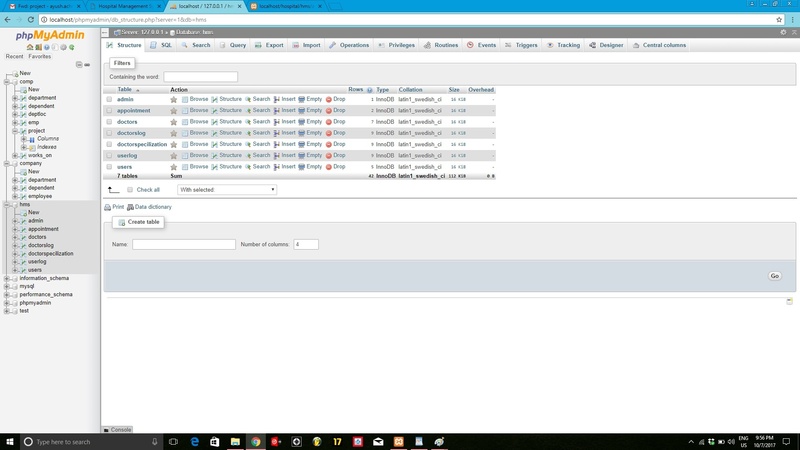 I created hms database on phpMyAdmin and also imported hms.sql in that database. 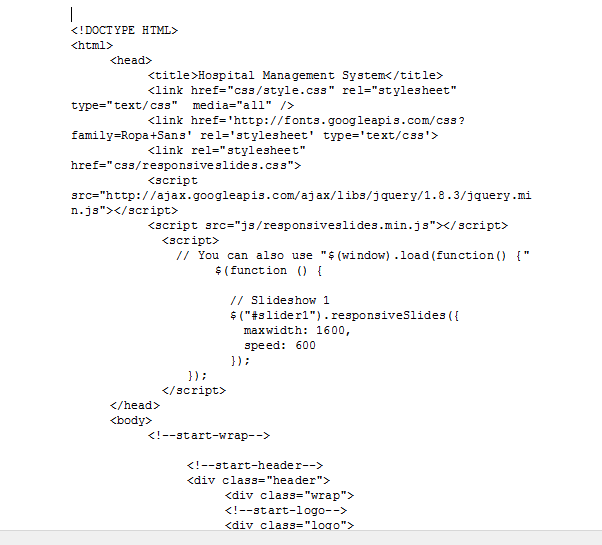 Now, when I go to my browser and type http://localhost/hostpital/ it shows the first page. 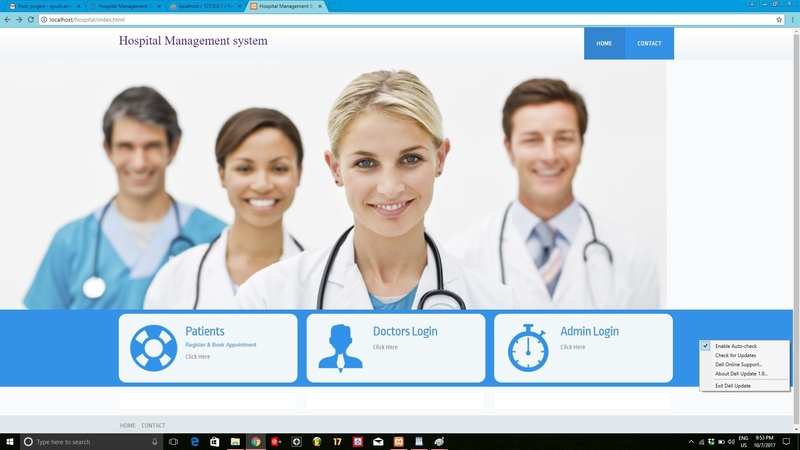 But, when I try to Login into Admin or Patient, it opens a page with no content on it. I have attached the images. Please reply ASAP. HI, can you please explain to me how to execute this project? 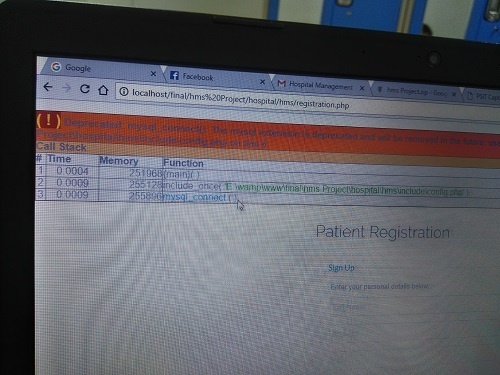 there is no error showed but when I want to add registration for new patient, it does not do anything and I look into database there is no new patient that I register. and can I add new admin, or new doctor? Because I try to make a new admin by insert it manually into database and it doesnt work. WHICH VERSION PHP SHOULD I DOWNLOAD TO RUN THIS PROJECT . I HAVE TRIED VARIOUS VERSION BUT IT GETTING ME PROBLEM EVERTYTIME. 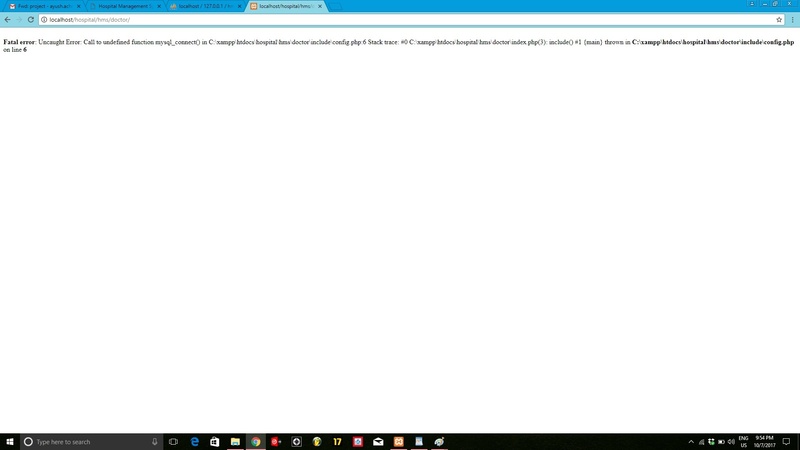 CAN U PLEASE PROVIDE DOWNLOAD LINK of which PHP VERSION SHOULD I DOWNLOAD DIRECTLY…..
Hello i want the full sorce code … i am not able to access the other pages other than the home page…!